Although I can’t imagine actually living in a house like this, I do believe that it has to be the most unique home I have ever seen. 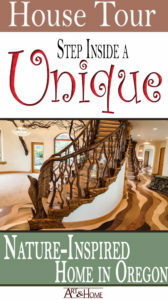 Built on 706 acres in the heart of Oregon, the design and construction of this unique home not only pays homage to the surrounding natural landscape, it fully embraces that landscape… creating a treehouse quality in some parts of the home. 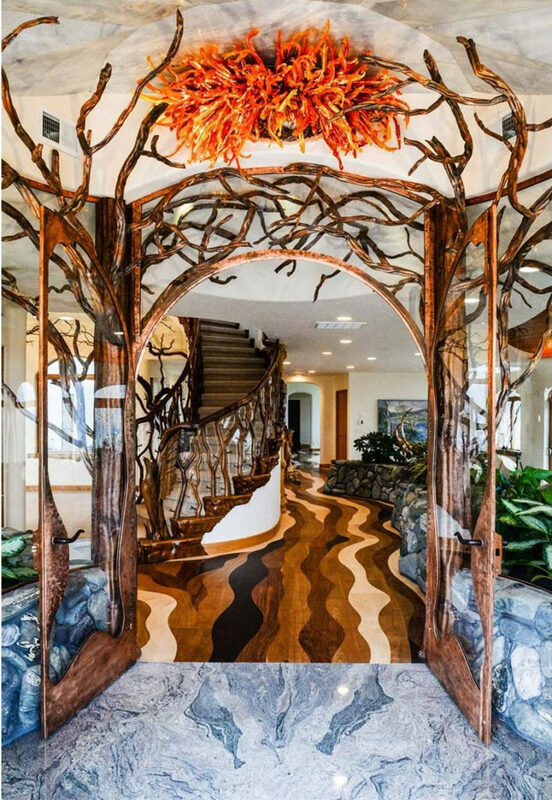 This is not your ordinary house, this unique home is nearly 9,000 square feet of nature-inspired art. This must have taken years to complete! The intricate details, carvings, flooring, etc. – it looks like a single detail was not missed in the painstaking design and creation of this home (well, maybe one or two… but we’ll get to that later). This house is truly custom. The entire home is built with graceful curves and rounded edges to reflect the organic flow of nature. Even the wood flooring was laid with such an intricate patter to represent the natural flow of a stream. But we’re getting ahead of ourselves… let’s start at the beginning. 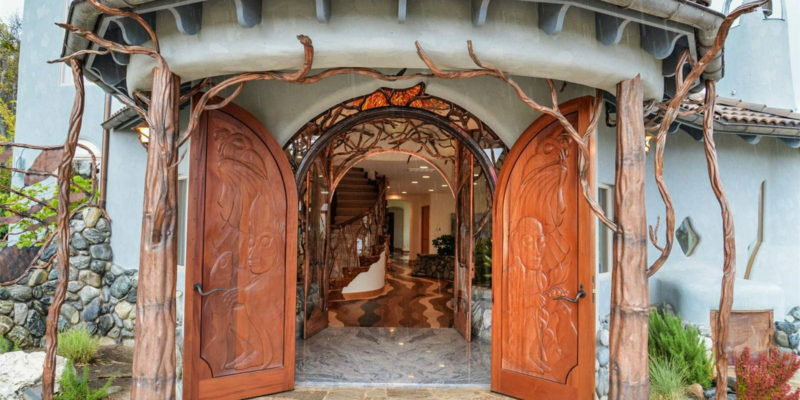 When you approach this unique Oregon home, you’ll be created by arched front doors that are framed by beautiful copper sculptures in the shape of trees. 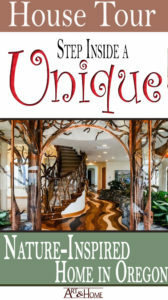 Their exquisite branches intertwine to enhance and support an absolutely breathtaking covered entrance. 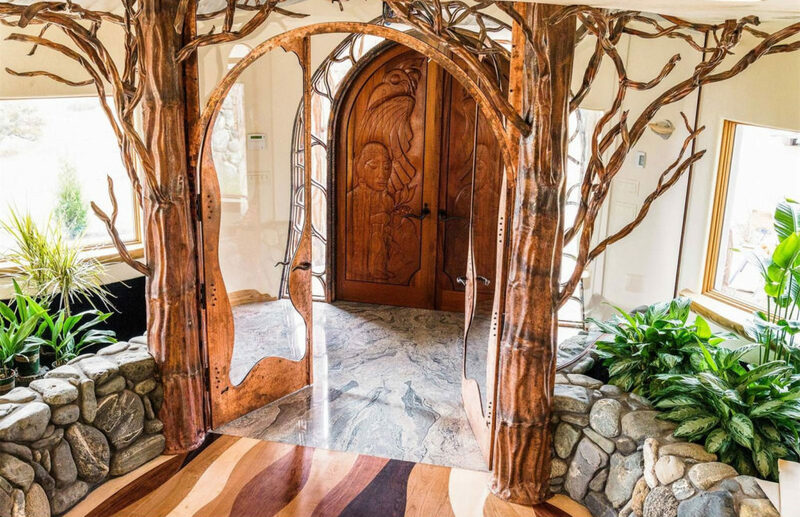 The Brazilian mahogany doors are not your ordinary front doors, they are – in fact – a set of sculptures by local artist Russell Beebe. 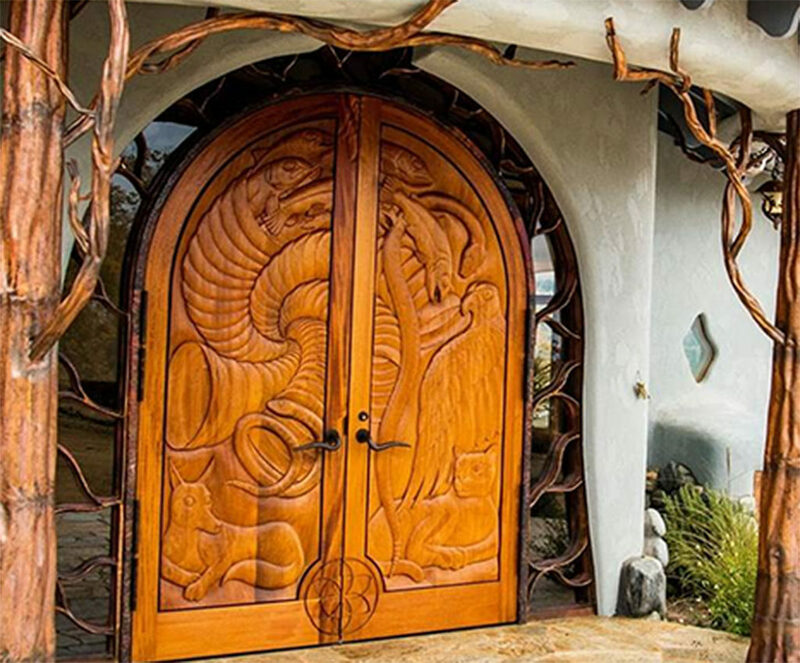 Following a Native American theme, you can see intricate animal carvings on the inside and outsides of the doors, including regional species such as salmon, coyotes and eagles. Notice the small, cloud-like window off to the right? You might have missed it at first, but these window details are a common theme throughout the rest of the house. As you venture inside, you can’t help but notice the granite flooring which has been installed to give the feeling of river’s edge. Nature-inspired tree sculptures continue to hug and enhance the architecture. Continue into this unique home and the shoreline ends at custom-designed and intricately laid hardwood floor that appears to flow like water. This intricate design is incredible and is a recurring pattern throughout the house. 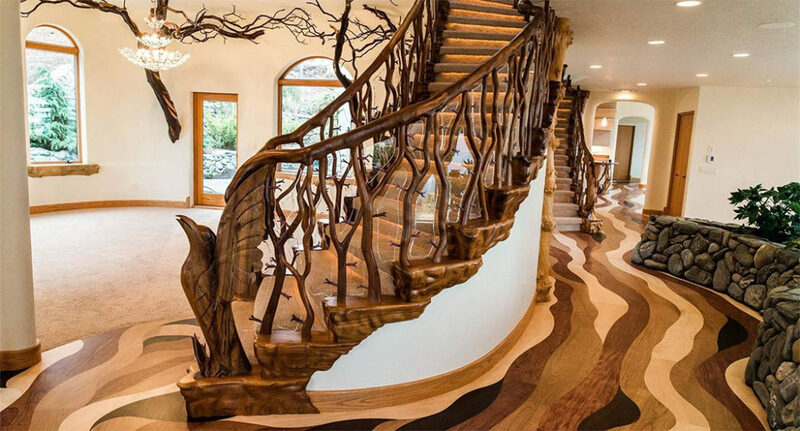 The unique staircase is another piece of art. 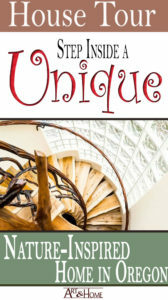 Sorry, I should say staircases (plural) as there are several throughout the home. I’ve written about Grand Staircases before, but these are – by far – the most intriguing staircases I’d ever NOT want to own. Each is intricately designed, carved, and crafted to make you feel as though you are climbing up or down a tree (just with less effort). Notice the vine-like handrails and the abundance of natural light. 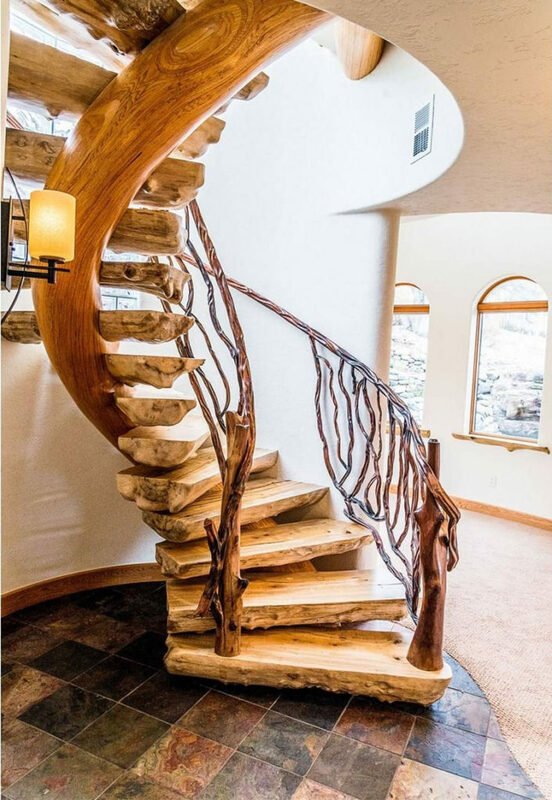 Live edge stair treads maintain that feeling of nature. 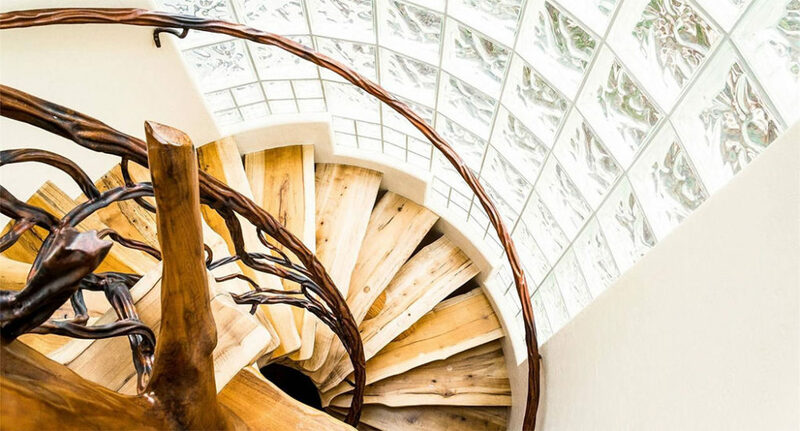 And what appears to be a single, curved tree trunk as the support structure for this circular staircase is beyond amazing. As you enter the kitchen, you can see how the floor transitions – and not in your typical way – to a warm, earth-tone Travertine. How they managed to pull off a curved transition from hardwood to stone, I will never know. 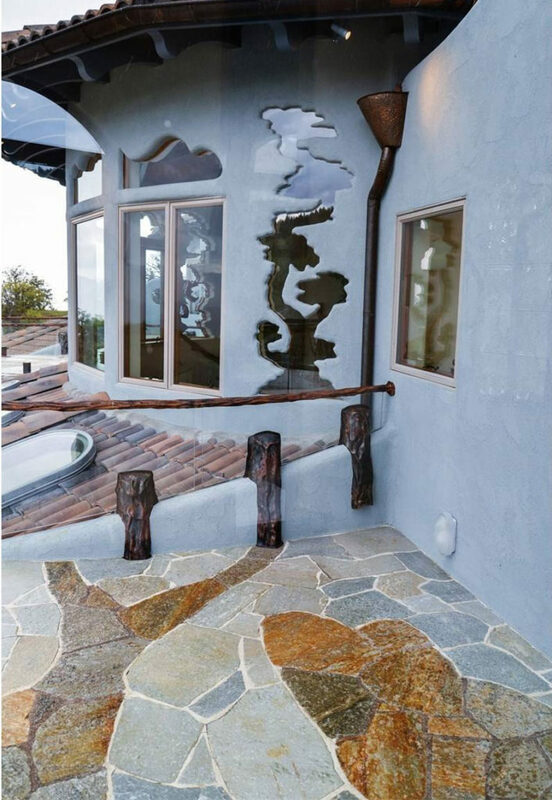 Notice the Manzanita tree trunks that support an over-sized granite island… creating a literal heart in the heart of this unique home. 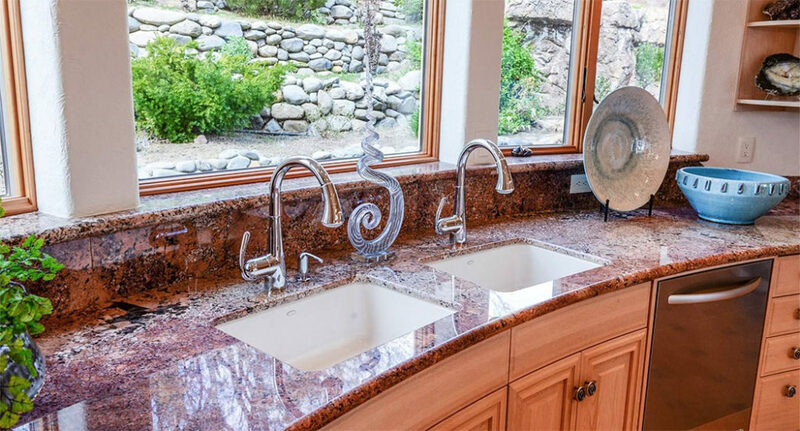 Even the kitchen counter-tops were custom crafted to maintain the flowing curves of the rest of the house. I don’t even want to begin the imagine the amount of custom cabinetry that went into making this curved kitchen happen. 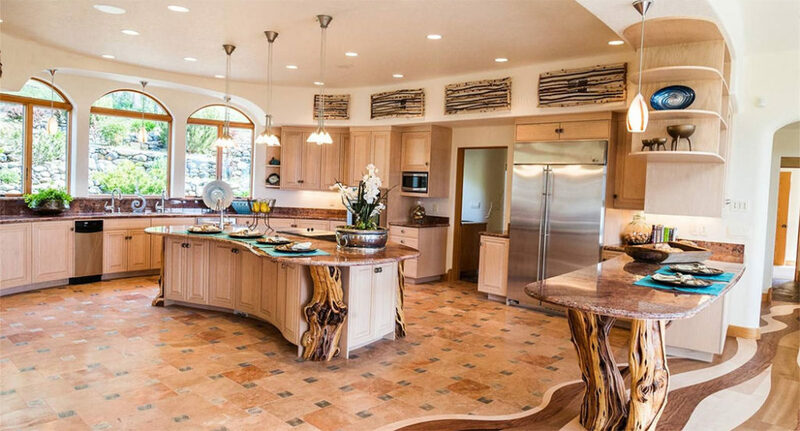 It’s obvious that no expense was spared in the creation of this home, and the kitchen is no exception. 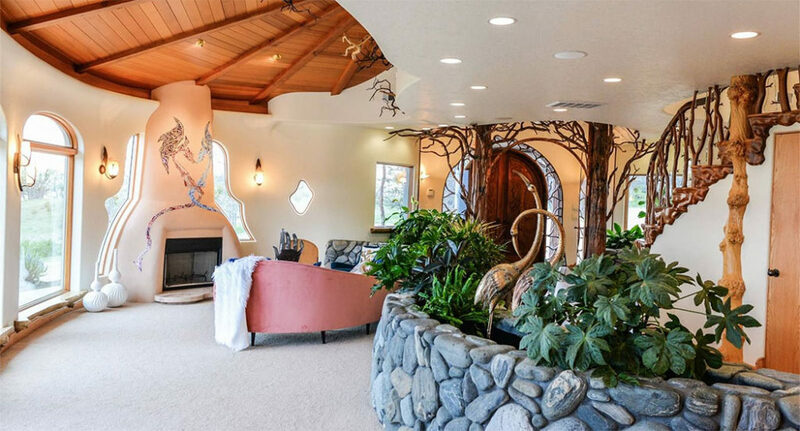 The living room has a grand, adobe-inspired wood-burning fireplace with a glass mosaic inlay of two intertwined dragons. This actually struck me as an add choice. Given the overtly natural theme throughout the rest of the house, I’m not sure I fully understand the infusion of dragons – a mythical creature. Although, I suppose, one could take a more mystical look at the entire house as a fantasy land where magic and nature combine. You don’t really notice any other mystical creature infusions throughout… no fairies or wood nymphs, for example… but you never know what might have been in the designer’s mind at the time. And – let’s face it – subtlety is not a term that would be used to describe this piece of architecture. 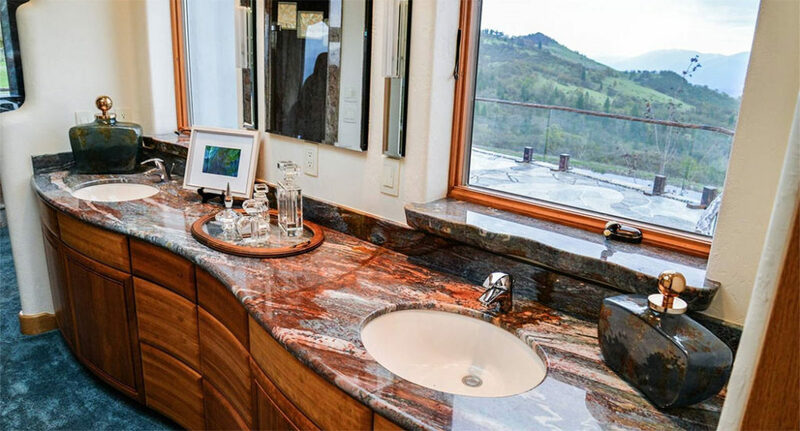 Upstairs, the master suite overlooks the valley with incredible views from a wall of windows. The cedar ceilings were expertly crafted with tapered tongue-and-groove planks and cedar beams to lend the room the feeling of a spacious treehouse. Custom designed windows in the shape of clouds, a windswept pine tree a nd a spruce tree frame this large bank of windows. These wonderful window design can be appreciated from both inside and outside of the bedroom. Step out onto the private patio, and you can see these unique windows from the outside. And you really should step out, because this patio also – and perhaps more importantly – this unique home offers some of the MOST spectacular views of the surrounding landscape. Reluctantly stepping back inside… The ensuite bathroom includes a double shower, jetted tub, plus a steam shower with natural boulders for benches and double sinks. Although fully functional, it still holds to that feeling of natural wonder. Except, perhaps, for that one oddly utilitarian door. In a house like this, I would not expect to see such a plain door. This isn’t the only plan door throughout, we spotted one downstairs as well. 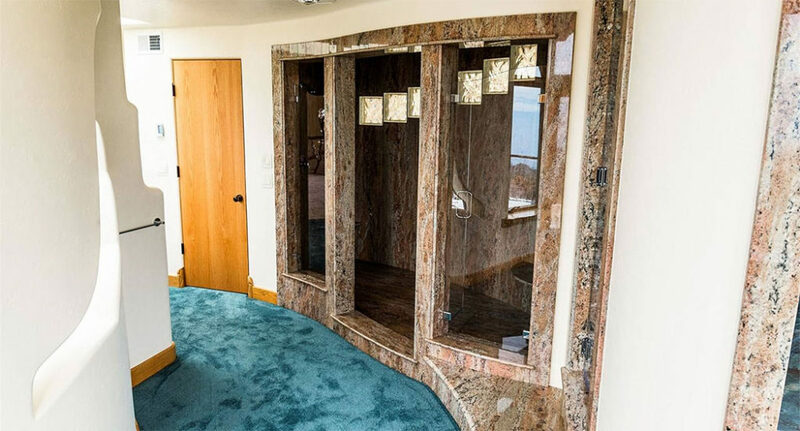 But – in contrast to the marble shower and the gorgeous blue floor – this one does seem to stick out. 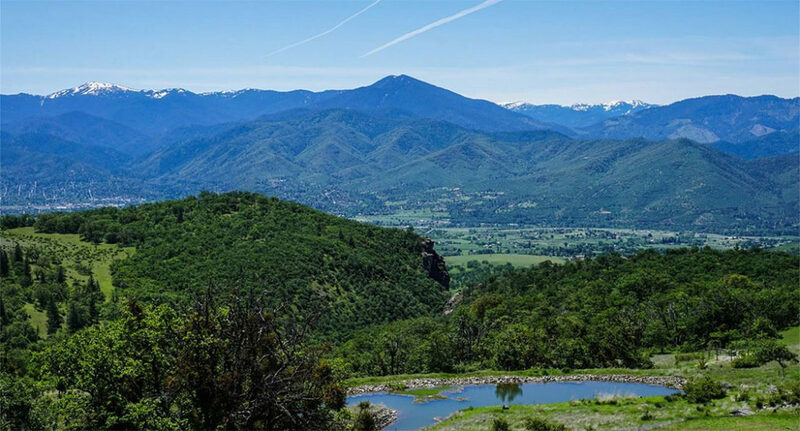 Located at 2700 N Valley View Road, which is only 20 minutes away from Ashland, Oregon; a delightful little town nestled in the foothills of mountain ranges and surrounded by rivers. It’s almost as if Ashland itself inspired this home, but I suppose we might never really know what was behind the incredible vision that became this unique house. It’s obvious that the home was built for the owner, and not for resale value. 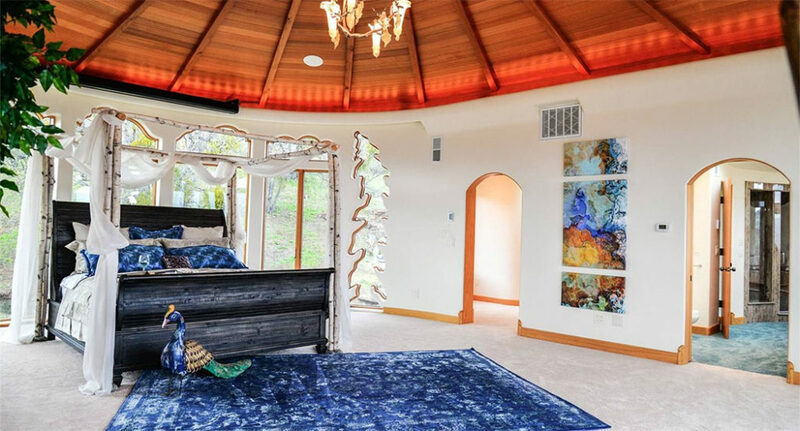 Despite that, this unique home is currently on the market for a mere $7.6 Million dollars. Which – I must admit – surprises me. 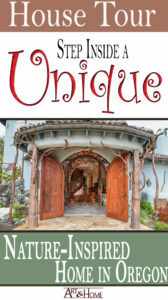 Given how much care and attention went into crafting this extraordinarily unique home, one can’t help but wonder why it home would be on the market only a few short years after its completion. You can read more about this property, and other fine luxury estates at Christie’s International Real Estate. For even more inspiration, checkout our Cool Houses board on Pinterest!